Montgomery County’s Department of Liquor Control says it has a new plan to fix its long list of problems, but lawmakers say they’re not convinced it will work. The News4 I-Team first exposed serious issues inside the troubled agency in its Beer Bust investigative series. We found employees accused of stealing alcohol and drinking on the job. 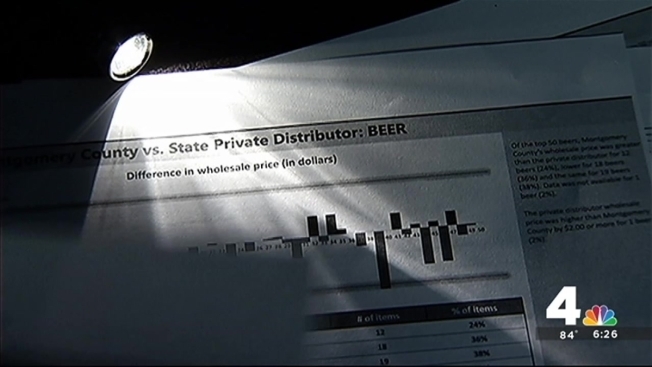 We showed how the agency was tracking more than $34 million in alcohol sales using a paper-based system with the county’s Inspector General later revealing employees sometimes used “sticky notes” to track missing inventory. And we took you inside restaurants to show why they say DLC’s new computer system is failing them by not providing them the alcohol they say they need to stay in business. Montgomery County Council created a special ad hoc committee to investigate these problem and recently asked DLC to start providing an “action plan” to address it’s long list of concerns. Friday, DLC presented 200 “action items” it says it's now undertaking to fix these problems, including electronically tracking inventory, creating a new customer service call center and conducting focus groups to improve the business operation. But throughout the hearing, council members interrupted and questioned many of the proposal, expressing increasing frustration and skepticism the agency was actually doing enough, fast enough, to address the problem. DLC said it hopes many of the improvements, including scanning all of its alcohol products throughout the delivery process, will be in place by midsummer.